Why not let an experienced electrician handle all of your electrical installations? One of the most important characteristics of any home is the electrics powering it. You want your property to be both efficient and safe, ensuring you can feel secure and comfortable in your home at all times. That’s why when it comes to any electrical work, from rewiring to electrical installation, Handyman Near Me has you covered! Our electricians London team can take care of everything for you, from installation to fittings, so if you’re searching for an electrician near me, look no further. We can help with a set of basic and advanced electrical installation jobs. 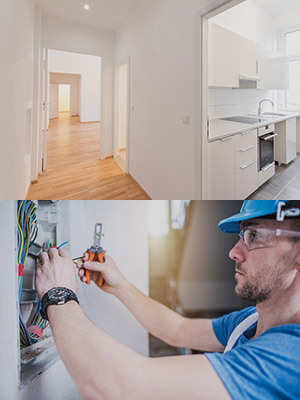 Our handymen can safely connect newly built properties, garages, or property extensions to the local power grid, perform partial or complete rewiring in accordance with the electrical wiring regulations or install sockets, television and telephone points. If your water heater or radiator system fails, you need a fast repair. Call us immediately when you are looking for a reputable electrician near me, and we’ll help fix and even replace your heating system quickly. Whether you need a repair for your water heater, a replacement on your radiator’s valves or you want to mount modern electrical radiators in your home, our experts can do it. Save yourself and your home the danger of improperly installed sockets or a faulty power strip by hiring us. We will improve the safety of your outlets and even install new switches or power socket in no time at all. When you receive a new appliance, we can help you install it, keep track of the hardware, and of course be happy to dispose of your previous appliance safely. Get your kitchen up and running with confidence. We pride ourselves on being a full-service repair company that can handle all of your electrical projects, repairs, and replacements. Our teams are available to you 24/7, so whether you want a reliable electrician on hand to finish off a renovation, or you have an emergency you want covered, we are here for you. We take safety very seriously, which is why we will never cut corners when it comes to your electricity. Don’t run the risk of attempting a repair or installation, either. Electrical output can be deadly. Instead, get the job done right by contacting us today and asking for a free quote. Whether you need an electrician, or a whole team to handle a renovation, we are here for you.